Between 1914 and 1918, men from the Chorley area fought and died in the First World War. Today’s parade, led by the Band of the King’s Division, retraces the steps many of the men took from the Drill Hall on Devonshire Road to the railway station, and off to war. Local men served at home and abroad in the Army, Navy and Royal Flying Corps (later the RAF), whilst many women played their part serving as medical and support staff with the likes of the VAD (Voluntary Aid Detachment). Two Army units were formed from local volunteers – ‘The Chorley Pals’ and the part-time soldiers in the Territorial Force, ‘The Chorley Terriers’. Both were infantry units of approximately 225 men, and would suffer heavy casualties during the war – the Terriers at the Battle of Festubert in June 1915 and the Pals on the first day of the Battle of the Somme on the 1st July 1916. The Terriers were already in uniform prior to the outbreak of war in 1914 and used the Drill Hall for their weekly training. Once the Pals were up to strength by the autumn of 1914, they too used the Devonshire Road building – it is still used by the army today. It is fitting that the Chorley Pals Memorial Trust, who have managed the ‘Chorley Remembers’ project since 2010 recognise the service of the Pals and Terriers by unveiling plaques today at the Drill Hall. 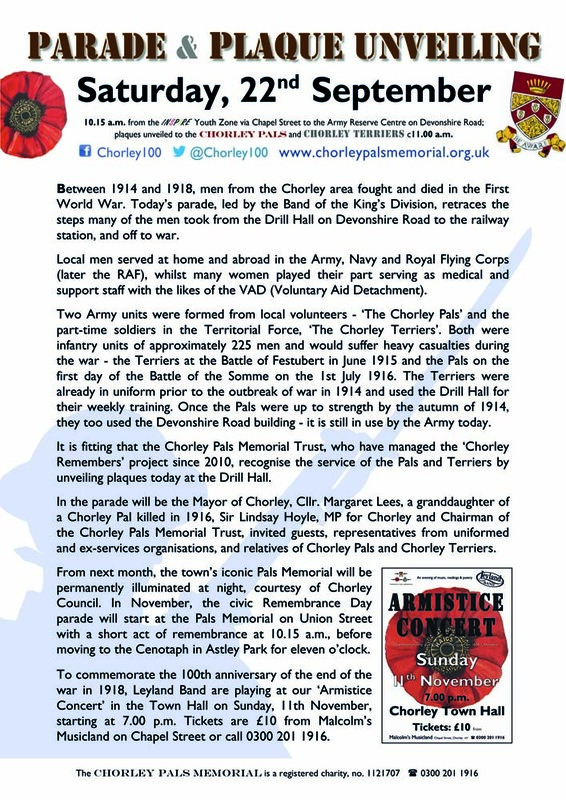 In the parade will be the Mayor of Chorley Cllr Margaret Lees, a granddaughter of a Chorley Pal killed in 1916, Sir Lindsay Hoyle, MP for Chorley and Chairman of the Chorley Pals Memorial Trust, invited guests, representatives from uniformed and ex-services organisations, and relatives of the Chorley Pals and Chorley Terriers. From next month, the town’s iconic Pals Memorial will be permanently illuminated at night, curtesy of Chorley Council. In November, the civic Remembrance Day parade will start at the Pals Memorial on Union Street with a short act of remembrance at 10.15am, before moving to the Cenotaph in Astley Park for 11 o’clock. To commemorate the 100th anniversary of the end of the war in 1918, Leyland Band are playing at our ‘Armistice Concert’ in the Town Hall on Sunday 11th November, starting at 7.00pm. Tickets are £10 from Malcolm’s Musicland on Chapel Street, or by calling 0300 201 1916.